Over a year ago, when we asked Ranger about his morning at preschool, we had a hard time getting a clear response. His responses to any open-ended questions (like "What did you see at the zoo?") came out of left field, and didn't really answer the questions. Often, he'd prefer to discuss something currently happening or something he wanted to do in the future. Storytelling was clearly not one of his interest areas. The resulting vagueness caused a lot of misunderstandings, and I was frustrated that he seemed disinterested in telling me about his experiences. In the Spring last year, illustrator Barbara Lehman 's wordless story The Red Book was featured in Ranger's Scholastic flier. Intrigued by the cute book's mysterious story, I added a copy to our order. The first naptime we settled in to read it, I asked Ranger questions about what he saw on each page and what he thought was happening. Each vibrant page offers a lot of things to observe and describe, and the cumulative story is both magical and clearly understood by an older toddler. The Red Book is a sweet adventure story about a new friendship where the narrative is told through sequential images that the reader can explore and interpret. Lehman's nonverbal storytelling encompasses enough mystery and magic that the events mandate explanation with each new discovery. Ranger really liked telling me the story of a child who finds a red book in a snow drift and the ensuing events. He empathized when one of the main characters became afraid and celebrated when everything worked out in the end. At naptime and bedtime, Ranger only wanted to read us The Red Book. His storytelling got better and better, and we all found new information in the images to make the story richer and more interesting. 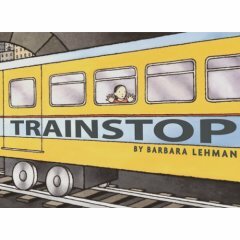 A month or two later, I bought all of Barbara Lehman's other wordless books: Rainstorm , Trainstop , and The Museum Trip . Each of her stories centers around brave discovery by a curious, courageous, and independent child. This is a great message for children finding their wings as new readers and storytellers. These are great books to get your kids talking and reading. The Red Book and Trainstop each tell the story of a girl while Rainstorm and The Museum Trip have boy primary characters. While the gender of the protagonist seems to have no influence on Ranger's enjoyment of a book, I like that Lehman varies boy and girl heroes in her adventures. Ranger's storytelling reluctance receded as he practiced daily with Lehman's books. These wonderful stories opened some important new avenues of communication for our family. A visiting friend's observation on Ranger's relationship with these books matched our own perceptions. Right now Amazon has The Red Book marked down to $9.32 (hardcover or Kindle edition) and a bargain paperback edition of The Museum Book for only $5.78 . 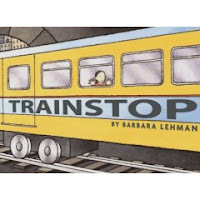 If you have a pre-reader chomping at the bit or a reluctant storyteller, definitely check out Barbara Lehman's picture books at your local library. 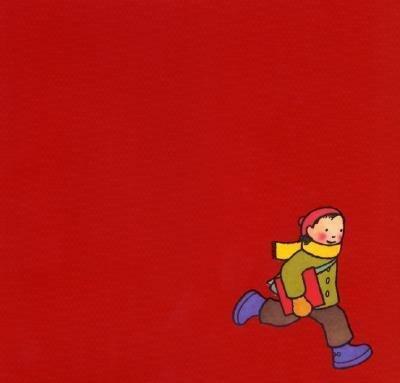 Which kids' books helped your family? ***Baby Toolkit is a collection of dispatches from some bibliophilic geeks with young children. While we love to curl up with a good book, we recognize that a lot of kids' books are dreadful. We also confess that there are a handful of books shoved under our heavy sofa so we never have to read them aloud again. We have no fiscal relationship with Barbara Lehman or her publishers. DISCLOSURE: Amazon associations we are, so a small portion of sales through our Amazon links comes back to Baby Toolkit and pays for our internet connectivity (thanks!). We are liking Odd Violet, A Bad Case of the Stripes, and Harold and the Purple Crayon. Our oldest loves Rechenka's Eggs too. Wow, Ranger sounds exactly like my Brendan at 3 1/2. I get the same answer everyday when I ask what he did at daycare and what he had for lunch. I'll have to try one of these books. Thanks. I had high hopes for the good old-fashioned "How to Behave and Why" but my kids are not surprisingly uninterested. Darn it! 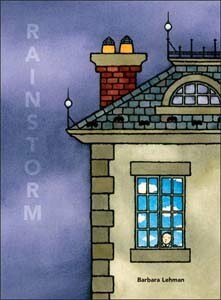 Raymond Briggs has several wordless books that you might want to check out. My favorite is "The Snowman." The Wally/Waldo books are complicated wordless stories (there are words, but they aren't important. They only frame the setup of each page, and the page itself is full of dozens of stories.